Carrie-Ohki is a cabbit. 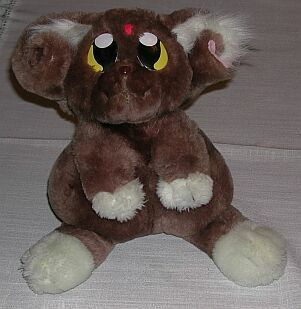 Actually I just call mine Carrie-Ohki; it's a reproduction of the cabbit Ryo-Ohki from the "Tenchi Muyo!" animes. I call mine Carrie-Ohki because it sounds like "karaoke" (if you mispronounce the word in the way Gaijin tend to do), and because I rolled up her ears to look like Princess Leia's hair buns. Sort of. Oh, and the gem on her forehead lights up when you squeeze her paw. I took this picture with some relatives' digital camera. I got my cabbit from Right Stuf. 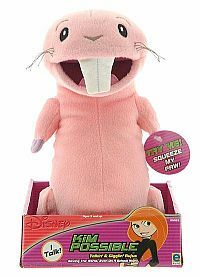 Rufus the naked mole rat, from the cartoon "Kim Possible." He says stuff or giggles when you squeeze his paw. I got Rufus from Walmart. Hamtaro the ham-ham, from the anime "Hamtaro." Um, I dunno what else to say. He doesn't do anything except sit there looking cute. I guess. I got Hamtaro from Dollar General. 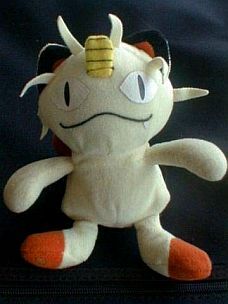 Pikachu and Meowth are a couple Pokémon plushes I got a few years ago, for like Christmas er sumpin. They been hangin' out in my room back in Maine, but now they've come to Ohio, so it's time to put them on this page. 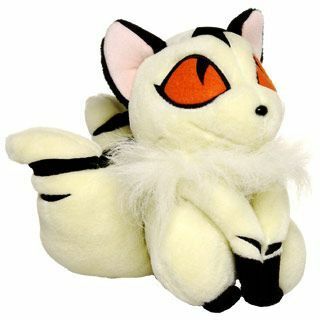 These pics aren't great, my plushes are cuter than this, but I guess these are the closest pics I can find to what they look like. Shame, really. Anyway, what else? They're thinking of playing Brian and Stewie Griffin in a buddy movie sometime. J/K. But it'd be cool, right? 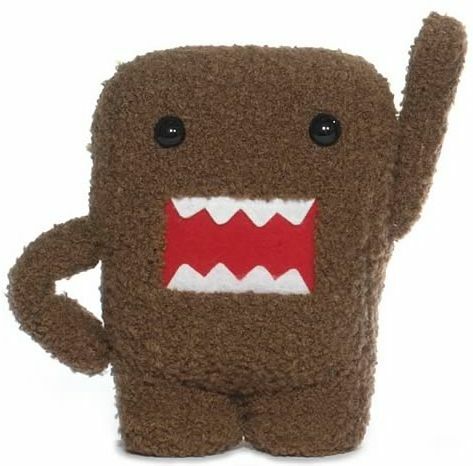 Domo-kun is not really from anime, but he is Japanese, so whatevs. 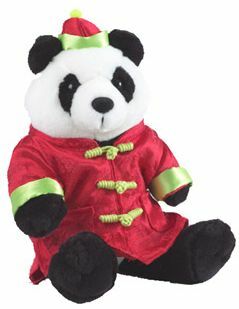 Um, I took this picture from Entertainment Earth, but I bought it at Target. The store's website doesn't have a pic of Domo, at least not without Halloween costumes (which you can see in my 2008 Halloween Journal). The one I got isn't really exactly like the pic I have here, but... close enough, I guess. I don't know Domo-kun very well, but I suppose I could watch some stuff on Domo nation. 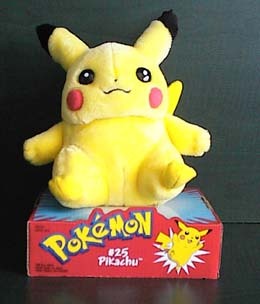 I have several things that happen to be from this collection, but I can't find an official website for it or any pictures of these plushes online. At least one of my Christmas bears my sister's given me is by Dan Dee. Princess Clawdine is this little cat that's supposed to be cotton candy-scented. Not sure what it actually smells like... I wouldn't say cotton candy, but it smells like some kind of candy, anyway. Well, it's cute. I wish I could find a pic online, but I can't, so I'll have to wait till I have a decent digital camera. Anyway, her collar has a heart on it which says "Princess," and I named her Clawdine after Claudine Longet, who has an incredible rendition of "God Only Knows" on the Gilmore Girls soundtrack.... 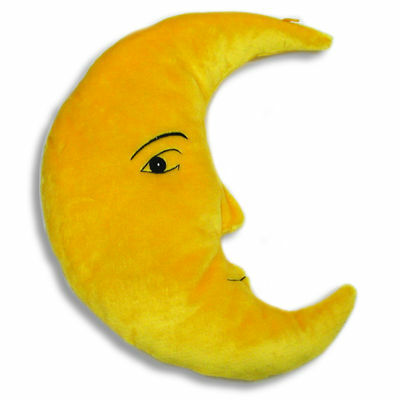 I bought this thing at Giant Eagle, where I worked at the time. St. Patrick's Day bear I haven't even bothered thinking of a name for this one. It's pretty small. Mom gave it to me for St. Patrick's Day, 2005. That is all. Lobstee is a lobster my parents sent me out here in Ohio to remind me of Maine. I think the tag said "My name is Medium Maine Lobster." That's not a good name for a lobster, okay? So I named him Lobstee, after the X Middle School mascot, from the cartoon "Fillmore." (This isn't under the cartoon category because it's not actually from the cartoon, I just took the name from there.) I dunno what else to say. ...update: I should add that for awhile now, my plushes have all been sitting on a shelf in my closet, and Lobstee has been wearing a baseball cap. And I think he looks like my cousin Karsten in it. I have no idea why. My sister thinks I'm crazy. That's okay, I think there are lots of crazy things about me, some of them not all bad, but I digress.... 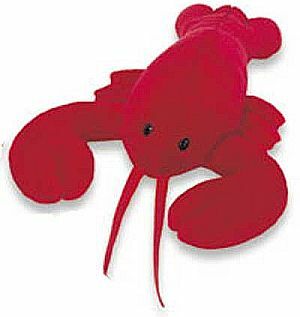 Anyway, if I ever have a digital camera, I'll take a picture of Lobstee in the hat. 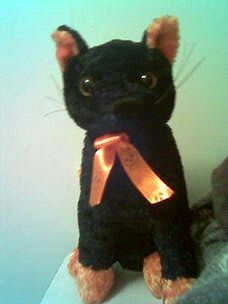 Mad Marv Caliwinks A sort of crazy-looking sort of plush cat mom gave me for Halloween in 2005. I'm not exactly sure where I came up with the name. I think "Caliwinks" is sort of a cross between "calico" and "Lemmiwinks" (from South Park). Dr. Koozbaniac is what I call this sort of plush, hanging witch thing that cackles. It looks sort of muppety to me. I sort of crossed the name Dr. Teeth (at least the Dr. part) with the words "Koozbanian" and "maniac." Dancing Hamster Leprechaun I don't really even think of this as a plush, but I suppose it sort of is. It's certainly not cuddly, or anything. But it's kinda cute. I haven't named it. It's just this hamster dressed like a leprechaun, who dances and sings "Come On Eileen" in a high-pitched chipmunky voice. PEEPS blue bunny Mom got me this. Not sure what to say. I never cared all that much for PEEPS, but I did see some in the store one time and thought they were cute. But I didn't get any. And a few weeks later Mom and Dad were visiting and gave one each to Beth and me. Gnarls Maulus Furry This is something I got at a yard sale one day. Also got some old TV Guides the guy was just giving away, and I didn't want to take something without buying anything. 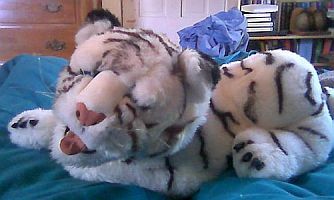 And this tiger looked cute, so I bought it for a buck. One day while trying to think of a name for him, Gnarls Barkley's video "Crazy" came on the TV, and it's all black and white with the Rorschach ink blots, and "Gnarls" just sounds like a good name for a tiger, IMO, so I thought maybe I'd go with that. It was several days at least before I decided on it definitely, though. Meanwhile, at some point I thought of Charles Wallace Murry, having recently read Madeleine L'Engle's Time Quartet. So I thought, "Gnarls Maulus." Some time later I thought of adding "Furry." Still, I usually just call him Gnarls. Oh, I should mention that his tag says he's from Discovery Channel. And, I snapped his pic with my camera phone. Halloween cat Mom got me this for Halloween 2006. Um. Dunno what else to say. Wild Things These came out around the time of the movie, I guess. I bought them at Grasshopper Shop, but didn't get a chance to see the movie in theaters. I expect I'll watch it someday, though. I took the images from Crocodile Creek. Beanie Babies I haven't got alot of these. The only one I can think of actually is Plankton, from "SpongeBob SquarePants." I bought that myself, but I feel like I might have others that were given to me. I should look around sometime. Curse my memory! 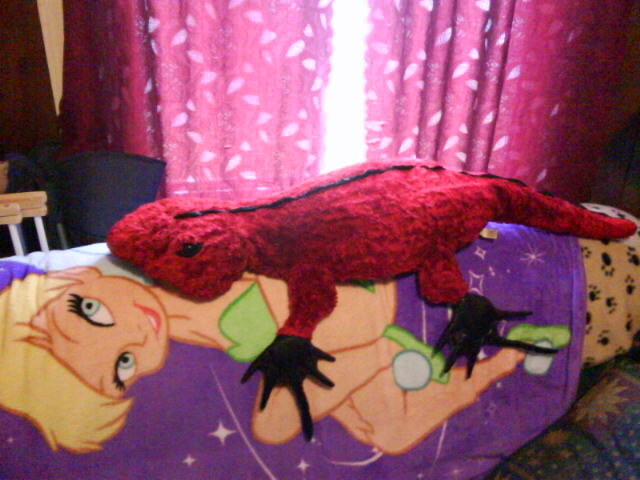 Anyway... any pics I include of Beanie Babies should be taken from the Ty website. Gizmo the Mogwai from "Gremlins"
Kero the Guardian Beast from "Cardcaptors"
probably lots of other things that escape me at the moment.